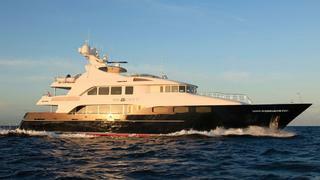 On November 23rd 2012 I reported that Carmine Galati at Galati Yacht Sales had found a buyer for the 42.7m motor yacht Big City and now Carmine tells me he's brought her back to the market. Launched by Trinity Yachts in 2009, Big City is a fine example of the company’s 141ft series of all-aluminium, semi- displacement motor yachts, and was built to the exacting standards of her experienced owners. She’s fully equipped with the latest technology including a Kaleidescape entertainment system and Quantum zero speed stabilisers. Big City can accommodate 10 guests in five staterooms, including a main deck master suite. Her Patrick Knowles interior balances traditional styling with modern fashion. On display at the Miami Show, Big City is asking $17.9 million.